Microwave Helmet Could Diagnose Strokes As Patients Ride To Hospital : Shots - Health News Strokes come in two varieties, and drugs that treat one type can be deadly for the other. An experimental device could help get the right treatment to patients while they're still in ambulances. 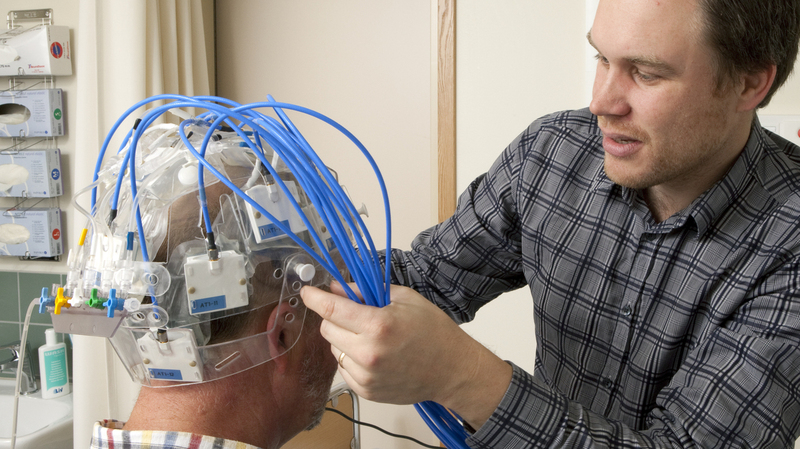 Andreas Fhager, a biomedical engineer at the Chalmers University of Technology in Sweden, adjusts the Strokefinder device on a test subject's head. When a stroke hits, brain cells perish at an alarming rate. The faster a patient gets treatment, the less likely it is that he or she will suffer permanent damage. But to pick the right treatment, doctors must find the underlying cause of the stroke fast. Most strokes occur when a clot blocks blood flow in the brain. For the best results, treatment of those strokes with clotbusting drugs should start less than 90 minutes after onset. But a significant fraction of strokes — around 1 in 5 — are caused by burst blood vessels. In these cases, clotbusting drugs cause catastrophic bleeding. In part because of the high risk, fewer than 8 percent of stroke patients receive treatment with clotbusters. But an odd-looking device under development in Sweden may one day help doctors diagnose the cause of stroke more rapidly. The device, which researchers dubbed "Strokefinder," was inspired by computerized simulations devised to investigate the effect of cellphone radiation on the brain. "We realized that when you change the brain it changes the wave patterns from mobile phones going through the brain, and we looked into the possibility that these wave patterns could detect brain trauma," biomedical engineer and Strokefinder designer Mikael Persson tells Shots. The Strokefinder prototype consists of an array of 12 antennas arranged around the head like a helmet. One by one, each antenna beams a low-power microwave signal through the skull, and the other 11 detect how the signal has changed after passing through the brain. The device then analyzes the microwave patterns to detect cranial bleeding. The whole process takes only a few seconds. Doctors now rely on CT scans of the brain to spot clots or bleeding, but precious time is wasted transporting patients to hospitals where these bulky machines are located. "The ultimate goal is to give treatment in the ambulance because so many brain cells are dying each second," says Persson. And while some specialized ambulances are outfitted with CT scanners, they are expensive, and sparsely populated or poor regions may never have access to these technologies. The Strokefinder is small and portable enough to be deployed in emergency vehicles everywhere. A paper published online by IEEE Transactions on Biomedical Engineering reports the first pair of clinical trials of the Strokefinder prototype. In the studies, the device was tested on 45 stroke patients, and the results were compared with CT scans. The device correctly identified all 19 patients suffering from cranial bleeding. However, it also gave five false positives by indicating that patients might have cranial bleeding when they were actually suffering from a blood clot. With further trials on patients, the researchers hope to improve their algorithms and decrease the false positive rate. The first ambulance trials begin in the fall. More testing is needed. "You need to ensure that it can detect small amounts of blood deep in the brain, because you can't afford to treat someone with bleeding," said neurologist James Grotta, a stroke specialist at Memorial Hermann-Texas Medical Center in Houston. However, he said he is intrigued by the idea of a cheap and portable diagnostic tool for stroke. "Right now we have had to load a CT scanner onto the ambulance, but that scanner costs over $400,000," he says. "With this device, every ambulance could have one."